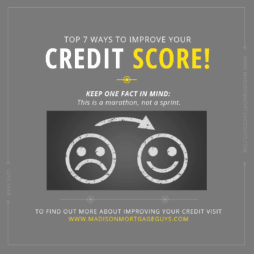 There can be a lot of steps to purchasing a home. It normally starts with scheduling a showing with an agent or attending an open house after you have been pre-approved. Then there is the process of deciding what features are absolutely necessary for the new property, versus the features that are just something a person would LIKE to have. Then a buyer has to make an offer and possibly negotiate with the seller or the seller’s agent. Finally, it is time for the home inspection and buyers feel as if a burden has been lifted. However, most buyers blow by the inspection and miss some critical information. 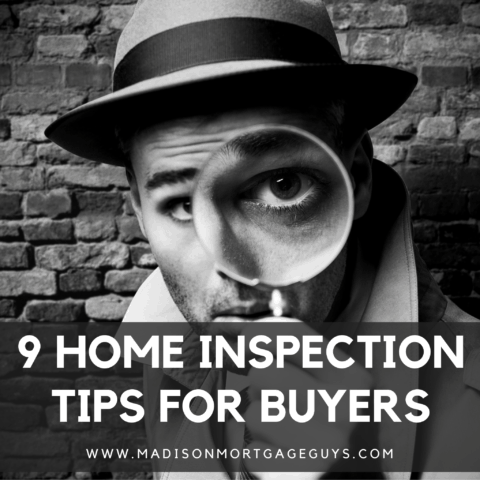 Here are 9 home inspection tips for buyers looking to get the most out of the inspector’s report of their potential new home. Most industries have the luxury-priced version of a service, and then there are the budget-minded providers that claim to offer the same service at significantly lower prices. However, we always get what we pay for. The safest route is to ask your real estate agent (yes, you should use a real estate agent to buy a house!) for the names of 2 or 3 home inspectors and then do some research on them. Most agents will know the companies that have a good reputation as well as the ones to avoid. Some people will walk through a home, get some information from the real estate agent and feel that the home is in good enough shape that an inspection is not needed. This is the worst option available. Things happen to homes all the time, unbeknown to the owner. Water heaters burst without warning, roofs develop a leak, and the HVAC decides to break down during the worst heat wave of the past 10 years. 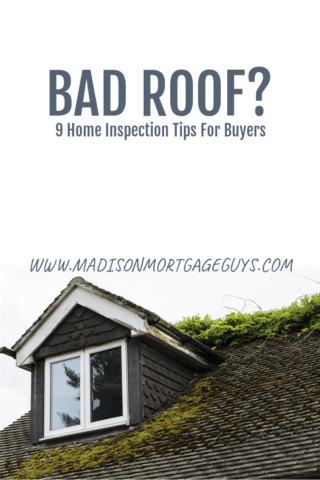 It may seem like a major expense now, but if the inspector uncovers a major problem, it could either lead you to choose another property or negotiate a better price. It does make sense to stand back and allow the inspector to do their job without too much interference. However, it is a bad idea to miss the inspection. You will have the chance to watch the inspector work and hear straight from their mouth what they think of the home. It also gives you a chance to ask questions about items that you don’t understand. This also presents an opportunity to learn about the home’s structure and features. Climbing into the attic, going through a basement or crawl space and testing all the different elements of the home will make you more comfortable with the condition of the place for the foreseeable future. Whether the home is new construction or 50 years old, there is a strong likelihood that the inspector will have a few items to list in their report. 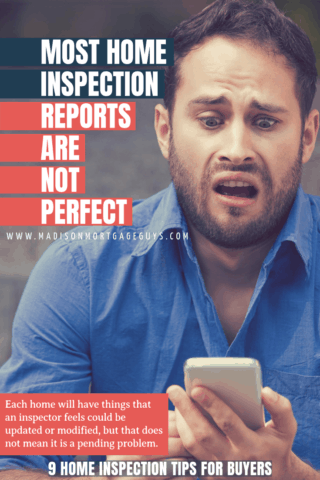 Each home will have things that an inspector feels could be updated or modified, but that does not mean it is a pending problem. Here are two simple examples that could appear in a report but do not have a significant impact on the home’s condition. Example 1: The inspector recommends changing out the air conditioner filters in all return receptacles in order to maximize airflow. For someone that is unfamiliar with this chore, it may sound a bit daunting. And dealing with the heater or air conditioning unit seems like a major expense. However, replacing the filters is something that homeowners should do every month and it is an inexpensive and simple job to complete. The inspector is merely pointing out that it is time for the filters to be replaced. Example 2: Gutters and downspouts show drain problem. Once again, this is a common item for homes with gutters. Most likely, the gutters need to be cleaned out thoroughly and the drain issue will be completely fixed. Most inspectors will take multiple pictures of the various places that are inspected, especially if there is a recommendation to make a repair or improvement. Review the pictures and determine if something is going to cause a pending problem now or if it is simply a maintenance issue like the examples from the previous section. Any repair issue needs to be discussed with your real estate agent if you wish to proceed with buying the home to determine who will be responsible for paying for the repair. The main point of the report is to learn if the home has any major structural problems or if any of the major systems are in need of extensive repair (systems like plumbing, electrical or HVAC). It is not a wise idea to ask a seller to replace every burned-out light bulb, a cracked electrical outlet cover, and steam clean the carpet that is brand new. Determine which battles are worth fighting and which items can be handled at a later date and take your concerns to your agent for negotiation. Making unnecessary home inspection repair requests can lead the seller to look at more appeasing offers that may be on the table. When was the roof last replaced/re-shingled? Ask the inspector if he/she walked over the roof and made notes of the condition. This is the time to make sure the roof is not a ticking time bomb waiting to explode with costly repairs. After getting the roof reviewed, make sure the inspector examines the attic. There are 2 possible items that can appear in the attic which are cause for concern. If a bathroom vent exits into the attic, all that moisture is festering in the attic and waiting to cause mold problems. The lack of insulation will force the HVAC system to work harder than necessary and create an uncomfortable environment in the home. It will be way too hot in the summer and extremely cold in the winter if the insulation is below industry standards. Make sure to read the inspector’s report about the attic and look for any signs of trouble. 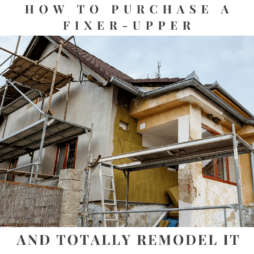 If you negotiate with the seller to make the necessary repairs before buying the home, it makes sense to confirm the repairs were done correctly. Asking the inspector to make a 2nd trip to review any repairs makes a lot of sense, even if an additional charge is involved. The seller may have tried to do the work on their own and skipped a step, or the contractor that was hired to do the work forgot one of the repairs. Either way, it is wise to have a 3rd party verify the repairs were completed correctly. By focusing on the important areas of the home and getting picture proof from the inspector, you can feel more at ease about the condition of the home. 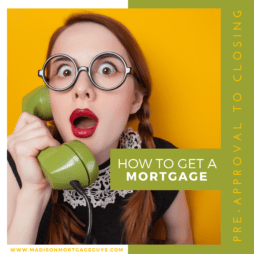 It really is a smart play to spend some money upfront to find out that the home is in move-in condition, rather than saving the money and later finding out about a major problem that will cost you lots of money.